On page 24 of this issue the joggling 50 mile world record time & other information is listed. This was a complete surprise. No picture (they ran a picture of a couple of dogs instead) and no online link, but I was really pleased to be mentioned in Sports Illustrated. That’s like for real athletes and the like. A short write-up in Cosmetics & Toiletries magazine can be found here. 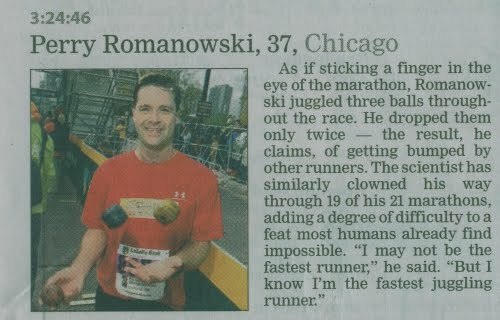 Vince Gerasole came out and did an interview about the world record and joggling in general. It was great fun and the piece was entertaining. To see the 2 minute TV story CLICK HERE! Nick Digilio talks with me after breaking the world record for the 50-mile joggling ultra marathon. Click here for the joggling interview. This is a 15 minute interview that I did with the great folks over at Endurance Planet. They produce an excellent broadcast interviewing all sorts of marathon, triathalon and other athletes. These guys saw the article in Time Out Chicago and we did 2 interviews of about 10 minutes each. It was my first time on the radio. It was great fun. That Nick is a hoot. Click on the picture to listen. 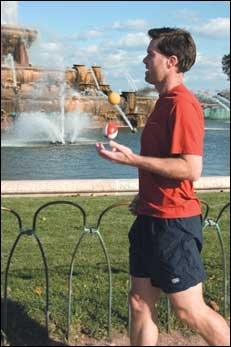 This joggling article was written by a free-lance writer (Susan Muskovitz) who happened to see me running along the lakefront path. She wrote about it in her blog and contacted me after I left her a comment. It was great fun to do the interview and the photo shoot. I didn’t know it at the time but someone took a picture of me running the Chicago Shamrock Shuffle and put it on the front cover of Chicago Athlete Magazine. I only found out about it when one of my friends told me they saw it. A fun article in Windy City Sports magazine. They profiled a bunch of different people doing the marathon and someone tipped them off to my story. Back then the world record for joggling a marathon was 3:20:49. Oh, how times have changed. This is one of the first bit of press that I ever received. I was really happy to get this small write-up in Runner’s World. We did a photo shoot and everything. That was cool. I don’t remember the date exactly but I got my picture in the Chicago Sun Times. I was training along the lakefront path and a photographer happened to be out there taking pictures. He was amused by me and snapped a photo for the newspaper. My mom was so proud.